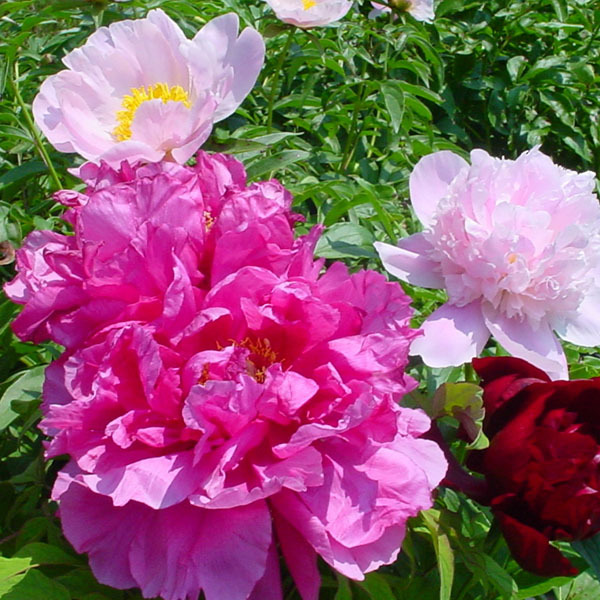 Clumps of peony outlast many homes and homeowners. A classic for June gardens. Hardy salvia is perfect for attracting butterflies and other important pollinators. Prefers moist, gravelly or sandy soils with good drainage, but tolerates drought. Plants may repeat bloom throughout the summer, but need regular moisture to encourage this. Remove spent flower spikes to help extend the bloom period. Knock-out Roses in pale yellow, pink, blushing pink and red bloom all summer and resist common rose diseases. That's easy care! Coreopsis is another perennial that offers foliage background when it's not in bloom. Cut back the spent flowers and it will send out a few fresh blooms in month or so. Foxglove is technically a bi-ennial. It forms the rosette base in the first year and blooms in the second, sets seed and germinates to repeat the cycle. There are now hybrids that will bloom every year. Perennial geranium cultivar 'Rozanne' takes hot sun. Blooms in June, cut back the blooms and blooms again in late August. This creamy white or pale yellow "Macy's Pride" is a favorite. Roses add long blooming substance to a perennial garden. Clematis vine is a showy flower in tender vines. Train on a trellis or against a fine mesh along a wall. Roots like it shady and moist but vines will find the sun. Amsonia is a native prairie flower with white to pale blue color choices. Hardy Gloxinia or Incarvillea delavayi. Fine in average, medium, well-drained soil in full sun to part shade. Remove faded flowers to prolong bloom period. May not be reliably winter hardy in the northern parts of USDA Zone 5.